This is the Rainbow Bridge poem. For those who don’t know about the Rainbow Bridge this is your chance to find out. Let it give you encouragement and hope. We all choose what we want to believe. I don’t remember the name of the movie but it had Robbin Williams and a very colorful Dalmatian in it. It was about the other side and all the colors kept changing and changing. A Pet Blog is incomplete without the Rainbow Bridge Poem. Now you know about The Rainbow Bridge Poem. I don’t know when it first arrived on the scene but something tells me that it will be here long after we are gone. Personally, I choose to believe in the Rainbow Bridge. Last night I gently stroked you as I watch you take your last breath. Belle my loyal friend and protector of my two children. We have loved you for 14 years and will always love you. You help raise Mailen and Clarence from small children to Adults and you did a wonderful job. I know as you took your last breath you were already at the Rainbow bridge. Knowing that you are able to run, jump and chase rabbits (that is what beagle dogs do) You are happy again. We miss you so much beagle girl and it has only been 12 hours. Thank you for all the love and joy you have given us. Forever in our hearts. Until we meet again. I love you for every and always and back again. My honeybear went to the rainbow bridge yesterday and I am very hurt by this but I know she can run and play now. And not in anymore pain. But I miss her we all love her lots. Every time I read this poem I cry but am happy she can do things again. and be well between the ages of 4 and 8? & see that neither of us are doing great. Hey! What’s with that fence and that gate? OK, I see the fence and it’s unusual gate. WAIT…I wanna’ go with you….Wait…I’ll always love you. It’s the Rainbow Bridge and I opened the gate I wasn’t allowed to follow…I couldn’t Tail-gate. I’ll see you again and it will be sooner than late. I can never forget you my friend of fate. Yesterday morning, we had to say goodbye to Checkers who has made a great impression on our lives for the last 14 years. I was seven years old when we brought her home, and I am now 21– most of my life that I can even remember, that old lady was there. It was far from easy, but her health had begun to decline in her old age, and it was for the best that we not let her suffer any longer– between tumors that only became worse seeing things that were not there as she began to go blind, arthritis making movement difficult, especially after she had and recovered from heart worm in her younger years. She evolved from the scared and skittish puppy we brought home, she grew into an amazing dog and was like a younger sister to me, especially since she and my brother were only separated in age by a few years. I mourn her loss now, but I know in my heart that she’s just waiting to see us again. I was sent this blog posting by a friend and it touched me, thank you for sharing something so beautiful. Mac to look for a special place for us to meet. We had to say good by to Wendy, our 9 year old Golden Retriever Jan 26, 2013. I gave her one last kiss and one last cookie treat then gave Dr. Andres the nod to to proceede. She passed away while I held her head softly in my hands. My wife and I are absolutely heart broken. Wendy was a very special dog and we will her dearly. I had a phone session with an animal communicator to contact Louie. Before the subject came up, she indicated to me that my mother,by name, greeted Louie into heaven when he passed. Mom knew the boys for one year before she died in March 2008. So the Rainbow Bridge has special meanings for me. I will have my own private memorial for Louie this Wednesday. Please say a pray for him. I miss him so much. The name of the Robin Williams movie you are thinking of is, “What Dreams May Come” – one of my personal favorites! Poor Finny. We are going to miss him. 13 years is a long time. On January 2nd 2013 I said goodbye to my CKCS Baxter. He was the most loyal companion I could have had for the last 12 1/2 years. He saw all 3 of my children into adulthood. In fact they all said that their childhood ended with his passing. He was my husband’s first dog. We are all so very sad. His German Shepherd “brother” is clearly depressed. There is such a void in our household, yet in spite of this, I can not help but reflect on the the goodness of God who created these ambassador’s of unconditional love. Almost like angels, they are our protectors, and comforters. I have no doubt that there will be a heavenly reunion for all of us. 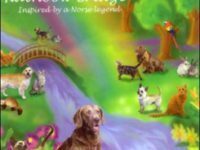 Legend of Rainbow Bridge by William N. Britton Published and copyrighted in 1994.
in the past 2 years i have lost 3 dogs and 1 cat , 3 of these pets in last 4 months. i am devstated. these animals loved me more than my husband loved me. I don’t know if i want to go on, but i still have i dog and 1 cat . I guess i will stick around for them. My stepfather passed away February 3, 2009. Yesterday, November 9, would have been his birthday. My mother and stepfather adopted Chance from the pound in September 1992. Chance was a faithful pet to my dad and mother. Chance was blind for several years before my dad passed away. My mother thought after my dad passed away that Chance would soon follow. But, he held on, alert and loyal. Yesterday Chance could not get up. His breathing was rapid, his heart was beating rapidly. His vet advised my mother to bring him in to put him down so he would not suffer. The vet said it is very unusual for a large dog to live beyond twelve years old. He explained that Chance would likely have a seizure and then a heart attack, and my mother would not want to see that. So, my mother took Chance to the vet and good old Chance, 20 years old; 140 in dog years was put to sleep. I knew of this poem and so I just read it to my mother. We can see in our mind’s eye my dad squatting down and calling Chance to him as he arrived…a great birthday commemoration for us. I found my loving 2. 5 year old ferret passed away I was out looking for a month outside with cages her beds putting ads in local papers, posters .A women phoned me when she first went missing, she asked me to phone her back. Seven days before I saw a rainbow and took a picture My heart has been broken the tears wouldn’t stop.When I phone the women back she told me about the meadow where your beloved pets go. The next day at doggie park a retired police officer.t old me to go on the computer and look up the “Rainbow brigde. I did and it gave me such comfort and the pain I had inside was lifted some I have many loving pets that have passed and I am looking forward to when my time comes I will be with them all I have inner peace and it has been easier to cope, knowing we will all be crossing the brigde together Thank-you all for sharing your stories. Her name was Yoggie dearly missed and loved very much. I had to make the difficult but necessary decision yesterday to euthanize my very best friend, my cat Annie who had been with me for 13 of her 14 years. She developed lymphoma recently and went downhill pretty quickly. This is the hardest time in my life, it seems. The Rainbow Bridge poem was framed on the wall in the vet’s office. I had never come across it before. It gave me comfort in those last moments of her life, as I held and stroked her and she fell asleep. I am going to print the poem (from your site)for my son who desperately misses her as well. Thank you so much for posting this meaningful poem. I lost my Max yesterday. Oh, the tears! For 13 years I had he and his sister trailing along behind me wherever I go. It is just us girls now. I miss all his little sounds and the laughter and love he gave. The Rainbow Bridge helped so much. It helps to have this site to be able to mention him on. Thank you. I know that all my babies that I have lost are waiting for me there. Hello there, typing theese words are proving difficult, as I am normally such a strong person! But loosing my beautiful pug ‘Darla’ has Offically brought me to my knees and left me heart broken, but seeing and reading this poem has given me that little bit of hope that I’ll see my Darla again. Therefore I choose to believe in rainbow bridge… So thank you! Lisa, I hope by now that time has helped to heal your heart from the loss of you Lab. Many of us can totally relate to your feelings when you held her in your arms for the last time. All the best to you. Hi Jason, isn’t that the truth. Being on the Rainbow Bridge and seeing all our pets run to meet us and play together for the longest time. Wow. Hi Cheryl, Yes we suffer along with them when they are at a certain point. It is truly agonizing for both. 16 years of dedication to each other is a long time. Be joyful in your memories. All the best. Hi Janice, I hope things are better for you now. What a moving story and so well written. Kaylee is very proud of your moving comment. All the very best to you. Hi Ashley, So sorry to hear about Minnie but you know 18 years is a long long time for a pet. I know, she was more like your child. I can relate. We had a pet live to be 18 or perhaps 19 years and when they go it rips your heart out for a while. I hope that since you wrote this you are feeling better and perhaps even have another kitty by now. That’s what Minnie would want you to do. All the best. I cry every time I read this poem. My sweet kitty had to be put to rest today due to renal failure. She lived a long 18 years. She was my fiancee’s cat. She had been with him since he was 5 years old. I got very attached to her when I began living with him. It seems so quiet in the house today. We have a Siberian Husky as well, but it just feels quiet and empty here tonight. I almost can’t sleep because I keep thinking about her. I just wish I could hear that meow one last time. I miss you so much Minnie. I have seen this poema few timeson facebook from friends who had lost their pets. I now face this myself…Kaylee my black English Lab, will be 9 on April 23, She was a rescue dog and I love her more than words can say…but in the end she saved me, after 35 years of marriage, I ended up divorced and alone, well not really Kaylee was always there for me and we have had many cuddle times with me pouring my heart out to her and she just being there. Now I face the decision to put her down as she is suffering terrribly from lymph node/bone cancer. I have brought her home for the Easter weekend and we will spend many quality hours together and we shall walk and smell all the places she loves. I have read this beautiful piece of writing several times. With each passing of my 2 dogs and 1 cat. It hurts like hell to read it the first time, but it helps to believe in that Bridge, and I believe when my time comes, that my dear friends will run to meet me, and maybe we will wait a day or two before crossing over together. I just had to put my 8year lab to sleep today. It was the most terrible thing I had to do. I do not have any children and she was like my daughter. But I could not let her suffer. I held her in my arms as she left this world. My heart is breaking and the tears will not stop. I loved her so very much and the emptiness is so strong right now. I too lost my beloved Labrador retriever just 3 days ago. He was two months before his 13th birthday, a long life for a big dog.I got him when he was just 6 weeks old. I saved him and he saved me. His body finally gave out and there was no choice but to have him euthanized. I held his head through the entire ordeal. This happened the day after my birthday. He saw everyone he loved that day and it was almost like he waited to give up until the next day. The pain I feel is unbearable. He had two “brothers” still with me and one of them refuses to eat. I don’t know how to comfort them. I try not to let them see me cry. I will pick up his ashes tomorrow. I love him and always will. The emptiness is like a piece of my heart was cut out. I was given this poem by a fellow cat lover.Although,I can’t read it without crying.I’m glad I do. I lost my little sweetheart suddenly after 20 short years, it was not enough time. I truly love her. I always will. I know I had 20 years, but it wasn’t enough.I struggle daily to deal with her not being with me. I take comfort in the hope that there is such a place, and I hope I will see her again. I love you moms little boo, and miss you like no one can imagine.I pray you are happy. My brother and his 2 dogs passed with him on Feb 10,2012. I am sending my sister-in-law the poem hoping that they all crossed “the rainbow bridge” together. Thank you for this beautiful poem. I lost my beautiful German Shephard today from multiple cancers, She was so dear to me. She was my constant companion and the dearest soul I have ever known. To me the rainbow bridge leads toheaven where she is now playing with my late husband. They arewaiting for me until my time comes to be with them. My Kaisy will always be in my heart. She was precious to me and I miss her so much. I found this poem a long time ago and sent it to so many friends and relatives who have lost their little ones who are like children to us older folks. It so comforting. Wish I could thank the writer. Rainbow bridge i found some 10 years ago when my then little girl faced the loss of her cat and the words were so right for her small broken heart. i was able to pass this wonderful poem on to a dear friend whose 2 little boys lost their dear doggie..again it spoke in such a way children understand and are comforted. I pray that there is a Rainbow Bridge. I lost my dear precious 7 1/2 year old CKCS “Charlie” on 1/24 to lymph node cancer. Having had many dogs throughout my life, Charlie was the only male dog I had ever owned. Never had I known a more devoted, loving dog in all my life. He followed me everywhere I went and never left my side. He adored me. There will never be another like him. I can’t wait to meet him at the Rainbow Bridge. We so sadly said goodbye to our beautiful and wonderful Labrador Cooper on Christmas eve, 2011. He was so immensely loved so it was a very hard time and then something even more awful happened. The Vet hospital made a mistake and had him cremated with other dogs instead of doing it privately as we had requested to have his ashes back. He was a dog who just loved being indoors right by my side. If I got up to leave the room he would no doubt follow me just to be with me. He was always getting under my feet (and he was a big dog!) but secretly I loved it. How much more loyal can you get than that. A companion for the last 11 3/4 years, not to be able to bring him home has been devastating. I’ve since come across this poem and would like to believe this is a place where he has gone to. It looks lovely and it’s nice to have an image of where he might be, after not getting a say in his final resting place. Sending you never ending love and cuddles Cooper. Love Mummy. they are all in a better place then we are we will all be seeing when our time is up.god bless. Dearest Maggie, Your comment is exactly what I hoped would happen from this post, a chance to think, feel and say what a past special friend has meant to us. Thank you so much for your comment. Our doggies find their rest in our back yard so we do think of them and visit them often. Unfortunately, we do move from time to time but although we can no longer visit they live forever in our hearts. Their memory never fades. All the best. The movie is called “What Dreams may come” & i referred to it today returning from La pet Memorial Park. My Weimaraner of 13.75 years crossed the Rainbow Bridge 1.08am today, she left peacefully, cradled in my arms. Los Angeles Pet Memorial park have a rainbow bridge for us to walk across, it’s beautiful. The cemetary has over 40.000 loved pets buried there, it”s truly amazing & very comforting. I will miss “My Girl, Ohshi” for the rest of my life, even though I know she will “visit” sometimes. Until my time comes. Dear Sharon, So sorry for your loss of your best friend. I can understand as like many I have lost such wonderful babies too. Yes, the poem helps, however it helps for each of us, it does help somehow. Whatever happens on the other side I too truly expect to see all my babies gather round to welcome me and I shall hold them all and show them I never forgot them. All the best to you in your time of grief. A Facebook friend gave me the name of this poem, I lost my 3 year old Bulldog today to cancer. He was a beautiful boy and full of love and fun. He brought much happiness to my family. This poem makes me feel at peace. I am looking forward to seeing all my loving animals when my time comes. Until then I will keep them close to me in my heart. I love and miss you Dozer, Ralph, Pugies, Princess, Jade. You all were my children and brought much happiness to my life. I lost my 4 year old beagle to lymphoma. This poem has brought me much comfort and i do believe i will see him again one day. I lost my 2 year old beagle to lymphoma. This poem has brought me much comfort and i do believe i will see him again one day. Our vet sent this poem to us after having to put our dog to sleep. I found peace when I read this even though we were still so very upset from our loss. I sent a copy of the poem to my dad and his wife this morning as they also had to put their dog to sleep this past weekend. I hope they can fine peace as well. Hi Leigh, Thanks so much. You are correct. What magnificent colors and a wonderful dog too. The Movie you are thinking of with Robin Williams is called “What Dreams May Come”. Dear Zoe Terry, Thank you for your kind comment here on the Rainbow Bridge Poem. Yes I am on Twitter at @billbeavers Thanks again. hello admin. i opened up my email today and kept following the links from page to page and somehow ended up here on %BLOGINTITLE%.. i’ve been reading your posts since then and i like the way you are writing. are you currently on twitter?? mainly because i would actually like to follow you and get informed whenever you post on your blog here. i’m trying to read all your posts and i’m enjoying them a whole lot. thanks a good deal for putting up a nice informative blog. Thank you.